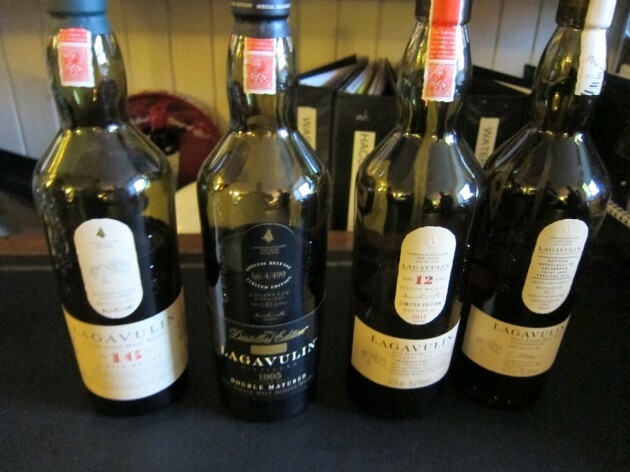 In many ways, Lagavulin and Caol Ila are brothers. Both distilleries are owned by Diageo, located within a a few miles of each other, and use the exact same malt from the Port Ellen Maltings (peated to the exact same level). But like brothers, even though Lagavulin and Caol Ila may share the same parents, each distillery has its own unique style, focus, and path. While Caol Ila is a servant to the never-ending thirst of Johnnie Walker, who uses whisky from Caol Ila in many of its blends, Lagavulin operates outside the constraints of blend production. Located on the coast of Kildalton, the southeastern edge of Islay, Lagavulin occupies an important historical space. The bay that fronts the distillery was a key shipping lane for the Lord of the Isles and the former site of Dunyvaig Castle. The distillery site is thought to have been an early place of brewing beer and ultimately distilling long before John Johnston founded the first legal distillery in 1816. 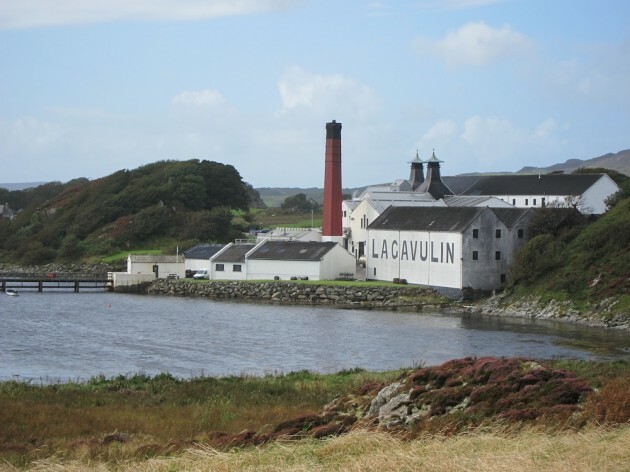 Lagavulin is also known for housing the legendary Malt Mill Distillery built in 1908 by Peter Mackie. Malt Mill recently was a central character in Ken Loach’s film “The Angel’s Share” where one of the main characters goes in search of a priceless lost cask from the distillery. While there still is a final bottle of new make spirit from Malt Mill stored the Lagavulin historical archives, much of Peter Mackie’s Malt Mill whisky was ultimately used in blended whisky called Mackie’s Ancient Scotch. 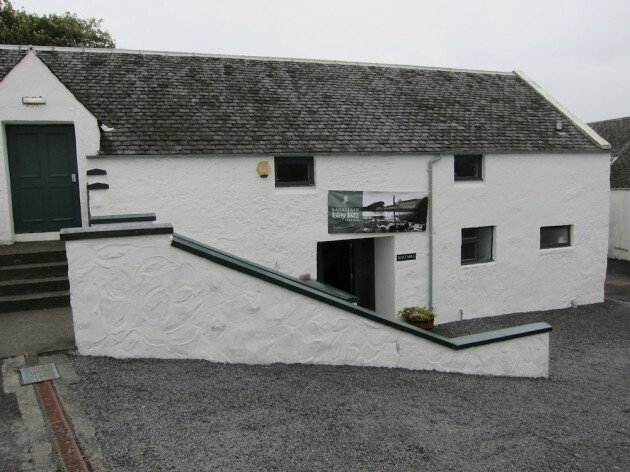 Lagavulin has taken over much of the old Malt Mill distillery with the exception of the floor malting room, which is used as one of the main concert halls for the Lagavulin Islay Jazz festival, held every September. As with its brother, Caol Ila, Lagavulin starts with the exact same malted barley from Port Ellen Maltings. This malt is milled and separated into the husk, the grist, and the flour. The proportion of these is important and impacts how well the mash tun process can extract fermentable sugars from the malt. Malting barley encourages the grain to naturally unlock the starches it would use as the source to produce a barley plant. The process is halted by the drying the malt, which is also when the grain is peated. Milling the malt further breaks down the barriers around the starch so it can be turned into fermentable sugars. The process of converting the grain starches into fermentable sugars happens in the mash tun. A mash tun is a giant stainless steel tank where the milled malt is combined with warm water, soaked, stirred, and drained. During this process enzymes from the outside of the husk of the grain convert the grist, which contains the starch, into a fermentable sugar called the wort. 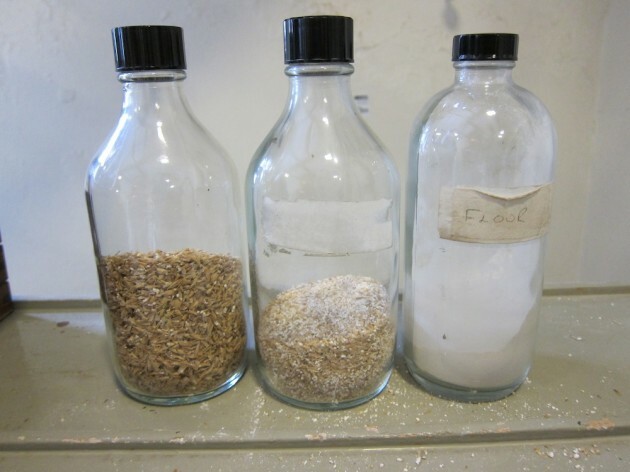 This process is repeated for each batch of grain to ensure that all the fermentable sugars are extracted. This process is also where the peat reek from the husk of the grain is transferred into the wort. Aside from converting starch into sugar, the mash tun process also creates a peaty barley tea which greatly impacts the final flavor of the whisky. 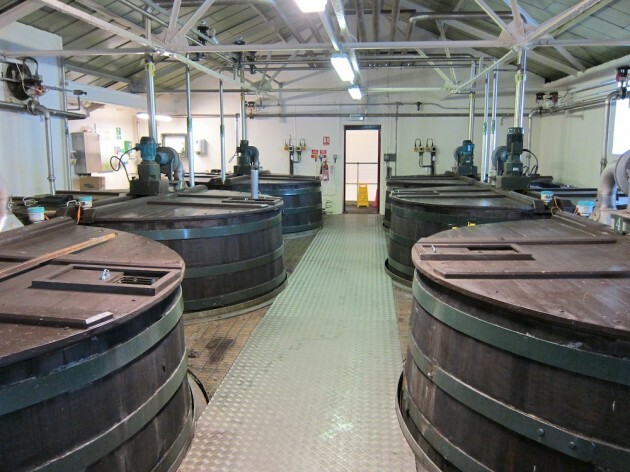 While similar, the mash tun process at Lagavulin is different than at Caol Ila. Lagavulin’s mash tun is the smallest on the island of Islay and they run it with much longer, slower heat times (the process in whole runs about five hours). It’s here where the paths of the two brother distilleries begin to diverge. After the mash tun process, the wort is transferred into large wooden fermentation tanks called washbacks made from American oak. In the washback, liquid yeast is added and the mix is left to ferment. 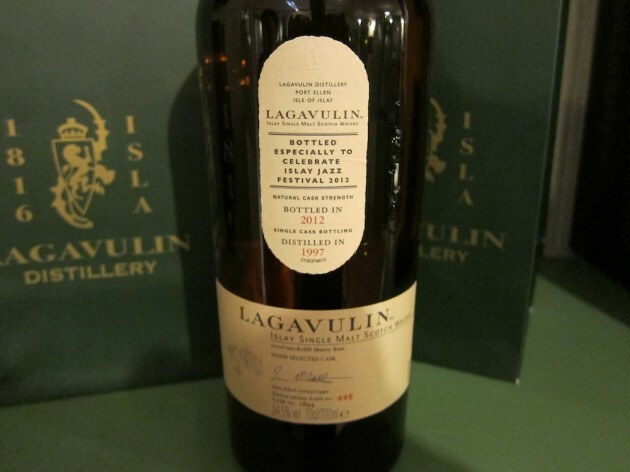 Lagavulin has one of the longer fermentation cycles, which runs 55 hours. At around 40 hours some of the natural bacteria which grows and is stored in the wood washbacks begins to interact with the wort. This natural bacteria helps deliver some of the citrus notes that you find in Lagavulin. The result of the fermentation process is a wash that is 8% alcohol. It’s often referred to as distiller’s beer, and although it’s not designed to be consumed, it is quite tasty. 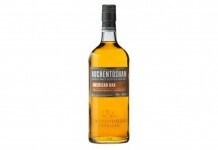 The wash has nice barley notes combined with clear citrus and nice smoke. 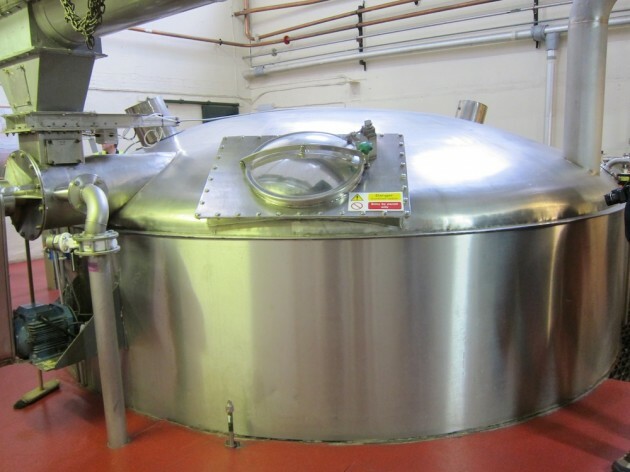 The wash is transferred into one of two wash stills where it’s very slowly distilled (a 10 1/2 hour process). Although the stills at Lagavulin are similar to those at Caol Ila, how they are used really helps dictate the final character of the whisky. At Lagavulin, the wash stills are filled to 95% of capacity which gives less contact between the alcohol vapors and the copper sides of the still. The copper in the still attracts some of the heavier elements from the vapor, and so the more contact a spirit has with vapor, the cleaner and softer it’s going to taste, and the less contact, the more congeners you can get. Lagavulin fills their stills to 95% while Caol Ila fills them to 50-60%, and that makes a huge difference in the final product. The ‘cut,’ or what’s taken out of the spirit still, is also wider at Lagavulin, with the heads and tails (in Scotland called foreshots and tails). How and where Lagavulin is aged is different as well. Caol Ila ships their spirit to the mainland of Scotland to be put into barrels and aged, while Lagavulin ages a significant amount of their whisky on Islay. There are over 6,000 casks of Lagavulin aging on the property, 6,000 aging over at the old Port Ellen Distillery, and another 3,000 casks aging (ironically) at Caol Ila. 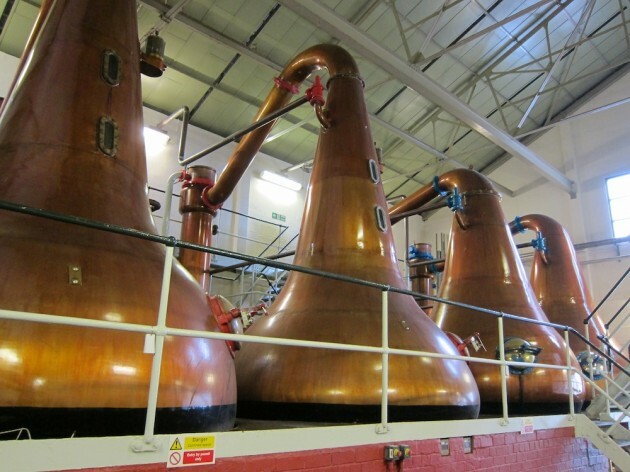 There are more casks aging on the main island of Scotland, but a large portion is on Islay. Like many whisky producers, Lagavulin uses previously used bourbon barrels. Lagavulin cleans the barrels, fills them with grain spirit, and lets them set for a full three years. The grain spirit is dumped out and the new make Lagavulin is added and aged. A final bottle of Lagavulin will be a combination from these ‘first fill’ barrels and barrels that have previously held Lagavulin. While most Scottish whisky producers offer a 10 or 12 year whisky as their entry point, Lagavulin’s entry level whisky is 16 years old. Lagavulin does release a 12 year old whisky annually (typically around October) as a Limited Edition with the precise vintage of the whisky and at a higher proof (the 2011 was at 57%). As their entry point offering, Lagavulin 16 is superb.The nose is amazing with honey, vanilla, malt, cereal grain, and dried plum. The entry is flavorful without the peat bomb that you get from many Islay whiskies. 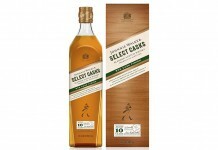 The opening is complex with toffee, caramel, dried plum, and slight smoke. The midplate features some nice rich red fruits along with clear cereal grains. The smokey peat really isn’t the star of the show until the finish where it balances superbly with the other flavors of the whisky. Lagavulin 16 is a fully integrated and balanced whisky that is a fantastic entry point for exploring Islay whisky. Lagavulin has a number of other special releases including a Distiller’s Edition that is finished in Pedro Jimenez casks, and a special annual Jazz Festival release which is only available at the distillery during the Islay Jazz Festival every September. Lagavulin will also soon release a special 21 year release that ranks among the best whisky we’ve tried, however the price tag that goes along with it is absurdly well over $500 a bottle (350 pounds a bottle). It’s is truly amazing that two distilleries, owned by the same company and using the exact same peated malt, can produce such dramatically different whiskies. Both Caol Ila and Lagavulin produce great whisky, but Lagavulin manages to do something really spectacular: they find the perfect balance of flavors and manage the peat smoke in a way where it’s an important part of the whisky, but doesn’t overpower it.